This was the first of the Tamiya Universal Carrier Conversions I saw, but the most recent I purchased. Perhaps I have left the best to last, as this kit comes with a fully detailed engine. 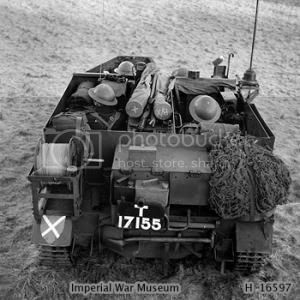 The AOP carrier was basically an Armoured Observation Post giving the Royal Artillery a quick means of moving around the battlefield and offering some limited protection. Initially Scout Carriers were used for this role, and were so successful that the AOP was developed. Aveling Barford produced the first AOP Mk I with 95 units being ordered. 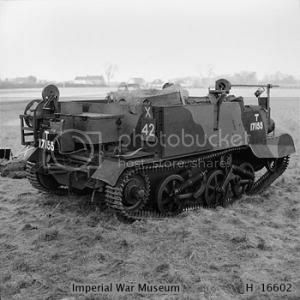 The Mk I Universal Carrier was adapted to fit this role; alterations were made to the front firing slot, and the addition of a variety of stowage brackets/boxes completed the conversion. Packed in a sturdy box, the kit come in a series of zip plastic bags wrapped for extra protection in bubble wrap. On the front of the box is a picture of the built kit, with 3 smaller pictures below. Opening the box was like lifting the layers off a cake, lol. Inside, wrapped in layers of bubble wrap, are a series of zip plastic bags containing the conversion parts, an instruction booklet and 2 frets of PE, plus some plastic rod. The instruction booklet contains 24 pages to guide you through the conversion. On the first page is a good picture of the actual carrier, and below it one of the completed kit. Page 2 gives a listing of the engine parts, page 3 lists the carrier resin parts and page 4 lists the PE parts. Pages 5 through 22 are the build instructions and page 23 has two fairly good black and white pictures of the actual carrier for reference. Page 24 contains the contact details for Resicast if you have any broken or missing parts. The black and white pictures in the build instructions are of good quality with the parts being clearly identified by part number. The build should be fairly easy to follow, but be sure and read through the instructions a few times and make sure you have identified all the parts. One thing I do like very much about the new Resicast instructions are that as well as the parts being numbered the listings tell you what they actually are, for example; CA = Cable Drum Left Frame. This actually helps understand the build in a much better way, rather than glue part 10 to part 15, which is fine, but then you don’t really know what part 10 and 15 are! The 1st layer revealed the tracks. This set of tracks were very cleanly cast and I have to say it was the production of these excellent replacement tracks that got me going down the carrier route in the first place. Along with them in the same layer were the parts for the radio and some stowage boxes and seats. All the parts were expertly cast with beautiful detail. Moving on to the second layer, this contained the drive wheels (you get 3 – 1 spare), lights, fire extinguishers, bins, gear levers, cable reel and a variety of other small items. Again I couldn’t fault a single part, they are simply just so expertly done. Also in this layer was the bag containing the engine parts. Unlike the other conversion sets the AOP carrier comes with a full engine build, this alone should make for an interesting build. Down in the 3rd layer you get the main replacement panels for the carrier, front and rear armour and the front and rear bulk head replacement parts. In total you get 7 bags of resin parts. All these parts look excellent, the detail is crisp and clear, clean up should be minimal and make this build a pleasure. Finally down at base level you get 2 frets of PE. One of these is for the engine and the other contains the main PE for the kit. Worth noting here are the additional PE items for the engine, a small fan and the engine side panels. Along with these are some plastic rods you will need for the build. This looks to be an outstanding conversion set. As before the level of detail, engineering and quality shine through on every item. It will be a harder conversion that the others, as there is some detailed building to be done on the engine, but that should make it even more enjoyable. I have now used 3 of the Universal Carrier conversion sets and each one has been both challenging and a joy to use. Yes, it takes more time, but the level of detail makes that worth the effort. This one should be no exception. Highs: An unusual conversion set offering an opportunity to build a much neglected version of the Universal Carrier. The full engine, outstanding detail and engineering, make this another cracking set from Resicast. Lows: Only the Credit Crunch, meaning your pound won’t go as far as it did before. Verdict: A really excellent set – Highly recommended. Bully review, Alan! My question would be: Of all the various versions of the Tamiya kit one can build, which one yields the best overall results? I thought, for example, that the Bren carrier looked awesome except for the Bren itself, which lacked the crisp detailing of a metal-upgraded MG. And then there's the question of "buildability." Which one goes together the nicest? It would seem from your review the AOP is the ticket.